iGeiger is a ratemeter program. It uses the microphone to detect the clicks from your geiger counter (or other device) and display the Counts Per Minute (CPM). 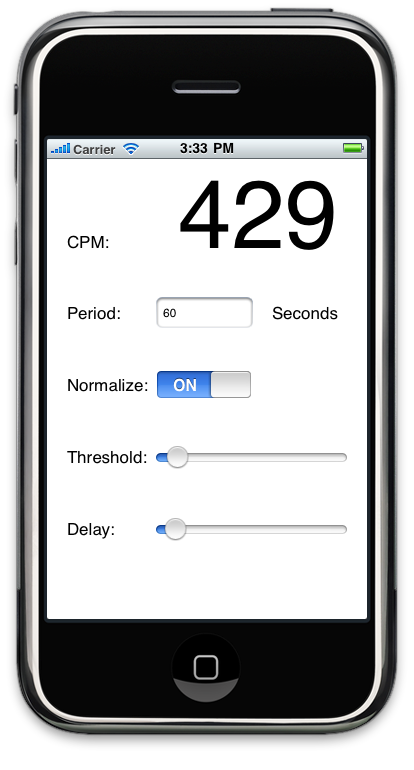 The measurement period can be set between 1 and 3600 seconds, and readings can be optionally normalized to one minute (60 seconds). The displayed value is grayed out until an entire measurement period's worth of readings has been accumulated. The minimum required volume of a click to be detected (threshold) can be set, as well as a delay time between clicks. Visit the iGeiger FAQ page for full details on how to use the app.